What You Don’t Know About Produce May Harm You Your Olive Oil: Is it Pure? In the two prior articles on fruits and vegetables we covered a lot of ground around making better fruit and vegetable choices, for your body and our planet. While we know fresh local organic fruits and vegetables are the best choice, most of us will need to call on canned or frozen vegetables on occasion because of time and convenience factors or seasonal availability. So before we leave the subject of fruits and vegetables, I’m going to discuss some important health implications to consider with frozen and canned vegetables and also look at how many servings you should really be eating. Let’s start by exploring the important question: Can you get the nutrition you need from five servings of fruits and vegetables per day? In addition, during transport, the fruits and vegetables are exposed to heat and light, which degrades certain vitamins like vitamin C and the B vitamins. Vitamins like C that react with oxygen change chemically so that they no longer work the same way in our bodies; this is called oxidative degradation. One study followed broccoli coming to market and found it traveled 2,095 miles from California to Chicago: That’s about four days if a truck travels 70 mph for eight hours a day. Add in the time from farm to truck and then from warehouse drop-off to market and then to your table and you can see that even domestic produce travels long and far. It’s estimated that fresh fruits and vegetables lose more than half of their nutritional value on the journey from farm to table (when they are not local). This concern is compounded because studies show that the inherent nutritional value of fruits and vegetables has declined significantly during the last 50 years. The vitamin and mineral content of produce is decreasing because of genetic modification, breeding practices that increase volume and cosmetic appeal, ripening systems, storage processes and chemical fertilizers. Four recent studies looked at data from 1930-1999 in the U.S., Canada and the U.K. Regardless of which time period was looked at or which country, the results were consistent: Nutrient value is declining. As an example, in 1951, a woman could get her full-recommended daily allowance of vitamin A from two peaches. Today, she would have to eat 53 to get that same nutritional content! This is why I recommend everyone take a whole food multi-vitamin, as it is difficult, if not impossible, to get your full nutritional needs from our food supply today, even if you eat really well. This is also why the Center for Disease Control and the Produce for Better Health Foundation have launched a campaign to increase fruit and vegetable consumption with the slogan “Fruits and Vegetables—More Matters.” This campaign replaces the old “five a day,” as it’s generally accepted now that five servings of fruits and vegetables are simply not enough any more. Seven to 13 portions a day for adults is considered the new standard, though based on the data above, even that may not be enough. Most of us simply don’t eat that much. The USDA guidelines are even lower, suggesting a range of five to 13 servings, but the FDA says that only 11% of Americans meet those levels. Twenty-five percent of Americans don’t eat any vegetables and 50% don’t eat any fruit on a daily basis. Without question, the best way to maximize the nutritional value of the produce you do eat is to buy local (preferably organic) and consume it within a few days. But if we are going to increase our daily fruit and vegetable consumption to the above recommend levels, or hopefully even beyond, most of us are going to have to look to frozen or canned options to get what we need: Fresh local produce in season simply won’t be possible year round. So let’s look at the issues around frozen and canned alternatives. I’ve already discussed some of the issues that fresh food faces on its journey to your table and why its nutritional profile may be diminished as a result. A recent study in the Journal of the Science of Food and Agriculture looked at the nutritional value of fresh versus frozen and canned vegetables and found them all to be comparable. While the study is imperfect in that “changes in moisture content during storage, cooking and processing can misrepresent changes in nutrient content” and suggests that a more accurate comparison would be possible if future research expressed nutrient data on a dry weight basis, nevertheless, the study concludes that recommending fresh vegetables exclusively ignores the nutrient benefits available from frozen and canned vegetables. In the case of canned fruits and vegetables, the thermal treatment in the initial processing can result in the loss of water-soluble and oxygen-labile nutrients such as vitamin C and the B vitamins. But after that, nutrients remain stable due to the lack of oxygen inside the can. Frozen products, on the other hand, lose fewer nutrients initially because they are typically blanched and then frozen within hours of being picked and there is less heat involved in the process. But they can lose more nutrients during storage time due to oxidation. The longer they stay in your freezer, the more nutrients they will lose, so as with fresh, try to consume them on a timely basis, especially after opening the bag. In the end, both lose slightly more nutrients than fresh produce but the study concludes they are good supplemental alternatives. However, it’s important to note that these processes do not alter pesticide residues, so frozen or canned produce is still susceptible to toxin exposure. In the study we looked at in the previous newsletter, (which examined the connection between kids who eat pesticide-ridden fruits and vegetables and the incidence rate of ADHD), one of the biggest offenders was frozen blueberries. While they may escape some exposure due to the fact that they don’t need to be sprayed to delay ripening or prevent insect damage in travel, frozen fruits and vegetables still absorb significant amounts of chemicals in the growing process that cannot be washed away. Even though many pesticides get into the core of the produce and cannot be washed away, you should always thoroughly wash any produce to remove what you can from the exterior. Frozen fruits and vegetables have not been washed and still require careful cleaning before consuming. And for the “dirty dozen” most pesticide-ridden fruits and vegetables, I still recommend you buy organic versions, even if you buy frozen. 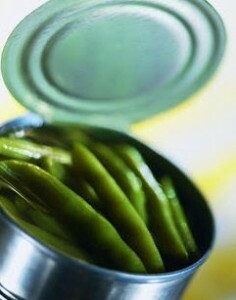 While canned vegetables may afford a similar nutritional profile to frozen or fresh vegetables, there is another very important health consideration that makes canned vegetables a less desirable choice: Bisphenol A or BPA. I’ll discuss the implications of BPAs in canned vegetables in the next newsletter.